Dr Leon Schreiber is a Senior Research Specialist for the Innovations for Successful Societies Programme at Princeton University in the United States, which conducts research on how to build effective and accountable governance in developing countries. In 2017, the Mail & Guardian named him as one of its Top 200 Young South Africans. He regularly participates in television and radio programmes as a political analyst, and writes for some of South Africa’s leading newspapers and magazines. About Coalition Country: South Africa after the ANC. Tafelberg [online]. 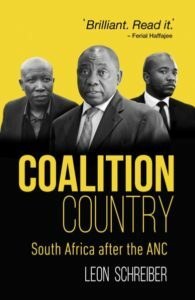 South Africa, a country of coalitions? Rebecca Davis, Daily Maverick, 18 April 2018. How A Coalition Government Could Actually be a Success in SA. Martin Schaefer, German Ambassador to South Africa, Huffington Post, 5 May 2018. DA in pole position to lead SA into the coalition country it will become. Leon Schreiber, Business Day, 4 April 2018.